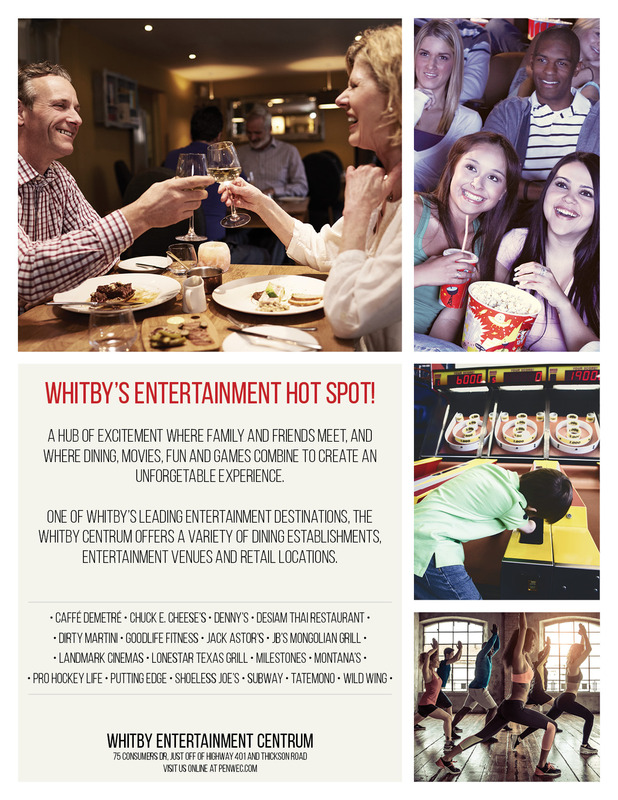 The client, Whitby Entertainment Centrum, is a leading entertainment destination, that offers a variety of dining establishments, entertainment venues and retail locations. The centre offers excitement and entertainment for the whole family. The client required an updated magazine advertisement that showcased what restaurants, venues and retail locations are located at the destination. We wanted to showcase a diverse set of people and age groups having a great time at the variety of activities that can be done at the destination. We included dining, movies, the arcade and a gym to showcase the range of activities that can be done. Each image was selected specifically for the excitement they portrayed. The photos were colour corrected to bring a congruous feeling to the ad, and provide an intimate atmosphere that would draw readers in.